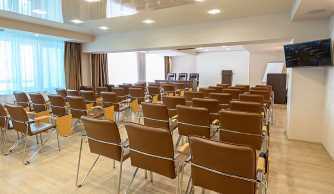 Conference services – rent of Conference Hall to carry out negotiations, seminars, conferences and presentations at the hotel "Novorossiysk". - organization of meal services and tour service. 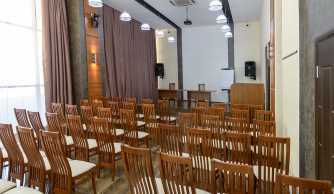 Roomy hall (total area 115 square meters) equipped with climate control and sound system, convenient for carrying out activities for 100-140 people. Small comfortable hall (total area – 55 sq. m) ideally befits for the holding of conferences for 49 members. The hall is equipped with air-conditioning system. To use these services, please contact with Commercial Department.